The Whirlpool WOS92EC0AS is a full-size wall oven that earns kudos for both baking and broiling. It also has a good number of extra features as well, such as a covered baking element and a handy convection conversion feature. Strong performance. 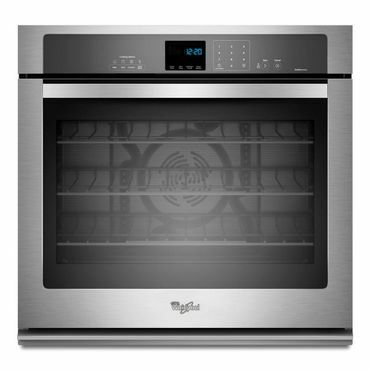 The Whirlpool WOS92EC0AS is rated as a Best Buy by Consumer Reports in the single electric wall oven category. In testing there, it earns a rating of Excellent for broiling, Very Good for baking. Editors at Reviewed say this 30-inch electric wall oven performs decently in most categories -- the keep-warm setting is especially accurate -- but say it takes a bit too long to preheat. Owners are mixed on that finding, though, while we saw a few complaints about a long preheat time, we saw many more who comment on how quickly the oven preheats, so we're calling that a draw. Users really adore the oven's convention cooking mode, saying it works really well and is a huge improvement over older, non-convection ovens they have owned. One quibble that we noted in many reviews, even from customers that were otherwise completely happy with the Whirlpool WOS92EC0AS, is that the circulation fan is noisy -- when it's heating, while it's cooking, and when it's cooling down. Good convenience features. The Whirlpool WOS92EC0AS has a covered baking element for easy cleanup, a convection conversion feature (which converts standard baking times and temperatures to convection equivalents) and a steam-cleaning option. Other features include convection bake, convection broil, delayed cooking, keep warm and Sabbath mode. Its generous five cubic foot capacity will accommodate your Thanksgiving turkey plus a few side dishes, and the large viewing window makes it easy to keep an eye on whatever you're cooking. The six rack guides and three racks make the space very flexible for a variety of dishes. An attractive, durable oven. "Sleek, modern and stylish," are adjectives we spotted frequently in owner reviews of the Whirlpool WOS92EC0AS. Many note that this wall oven gives their kitchen a very high-end appearance that they would expect to see in a much pricier model. This version is stainless steel, but it's also available in black as the Whirlpool WOS92EC0AB (Est. $1,550), white ice as the Whirlpool WOS92EC0AH (Est. $1,650) and black ice as the Whirlpool WOS92EC0AE (Est. $1,650). We saw reviews that singled out each color, and all seem to be equally pleased. As for durability, we spotted very few complaints in that area, fewer than we see with many ovens, and, in most cases, Whirlpool customer service reached out to the reviewer with a number they could call to resolve their issue. This series of ovens are also covered by the Whirlpool FIT system guarantee, which promises that it will fit into the same space as a comparable (height and width) wall oven that it's replacing.